Ranulph Higden (d. 1364), was a monk of the Benedictine abbey of St. Werburg, Chester. His 'Polychronicon' is a universal history, based on earlier writers, but extended down to his own lifetime. 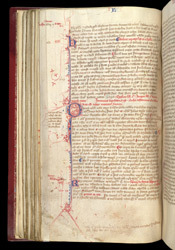 This copy has an ownership inscription of Simon Bozoun, who was prior of Norwich Cathedral Priory from 1344 to 1352. The end of Book II and start of Book III is marked with this initial 'Q', infilled with red penwork, leaving blank area of parchment in the form of a hybrid creature and foliage. The margins have annotations and various numbering systems, to allow readers to cross refer between passages of text.